Beautiful old color example of Visscher's map of Ireland. Hiberniae Regnum tam in praecipuas Ultoniae, Connaciae, Lageniae, et Momoniae, quam in minores earundem Provincias, et Ditiones subjacentes peraccurate divisum. 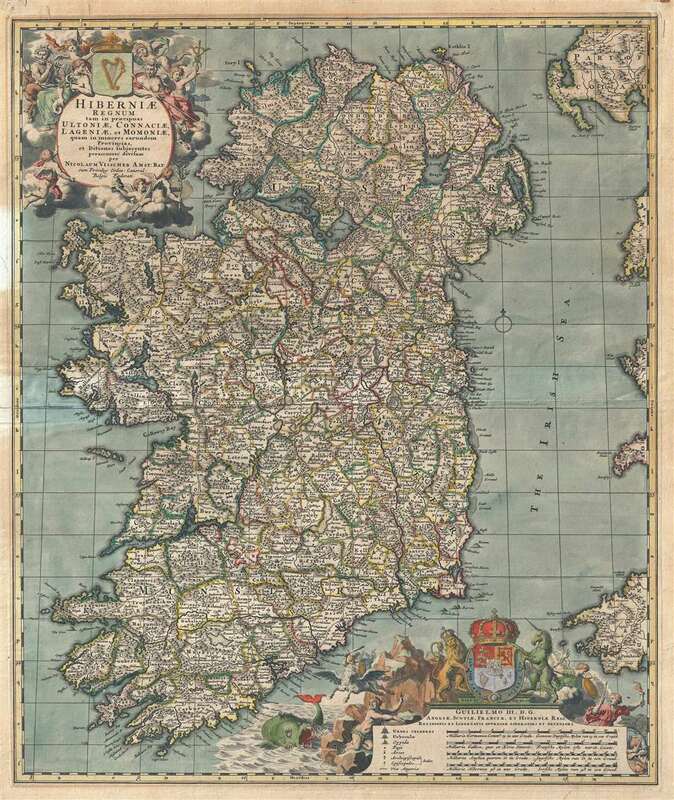 A beautiful example of Nicolas Visscher's c. 1690 map of Ireland in original old color. The map covers the entirety of Ireland and is subdivided into counties. Two impressive cartouches are rife with allegorical imagery, one appearing in the upper left, and a second in the lower right, surrounding the map's dedication, key, and scales. The map is dedicated to William III (1650 - 1702), also known as William of Orange, who became King of England Ireland and Scotland in 1689. The elaborate title cartouche in the upper right is rich with Gaelic iconography, including the Gaelic Harp and allegorical representations of Pan, a Celtic adaptation of the Roman god Bacchus, and Brigit, the Celtic goddess of poetry, healing, and agriculture. The lower cartouche features the royal crest of England, Scotland and Ireland. It also includes an impressive sea monster. The cartography follows on Frederick de Wit's map of 1662. Although several updates were implemented over the years, first by de Wit then by Visscher, most of the major changes were limited to the cartouche work. The map was later copied with minor revisions and changes by Petrus Schenk, Gerard Valk, and Johann Baptiste Homann. Good. A few minor verso repairs and reinforcements. Old color.